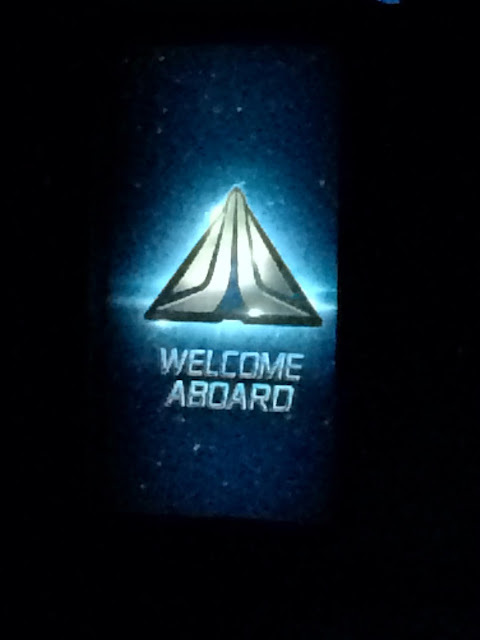 Today marks the beginning of a new era at Walt Disney World. 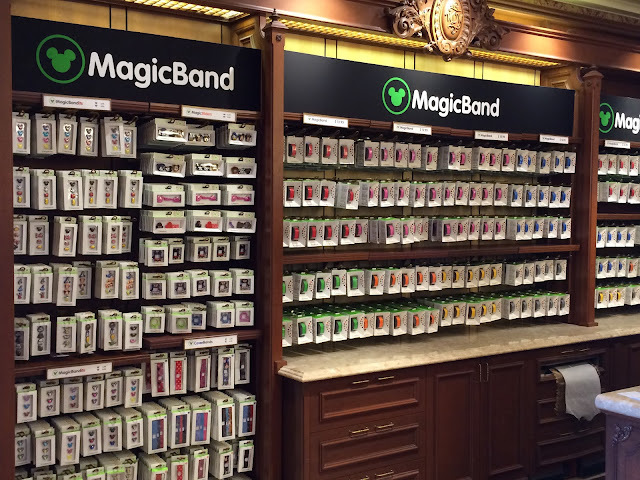 All guests are now able to acquire MagicBands inside the parks. Up until today, only resort guests and annual pass holders were able to utilize these high-tech bracelets. Now, they can be purchased by "day guests" as well. 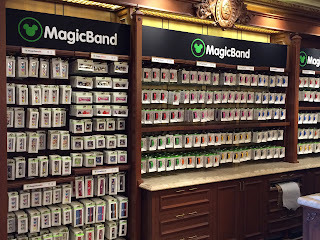 I took this shot in the Emporium while giving a Magic Kingdom tour today. The Seas with Nemo & Friends is a great pavilion at Epcot that features the second largest aquarium in America. I like to take my tour guests there early in the morning, as the big crowds don't arrive until later. 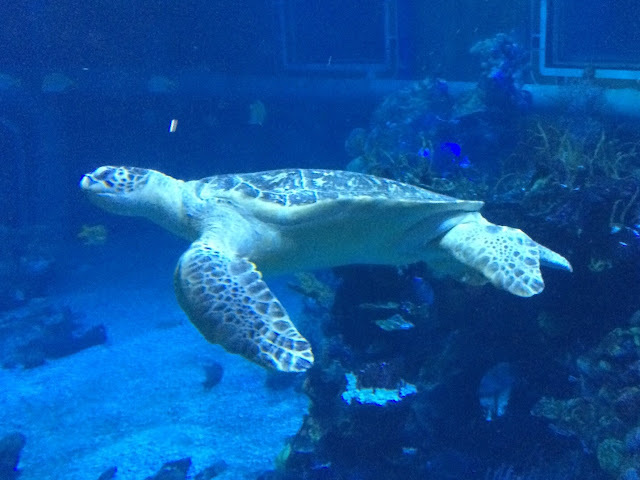 I snapped this shot of a sea turtle swimming in the main tank last week. Monsters Inc. 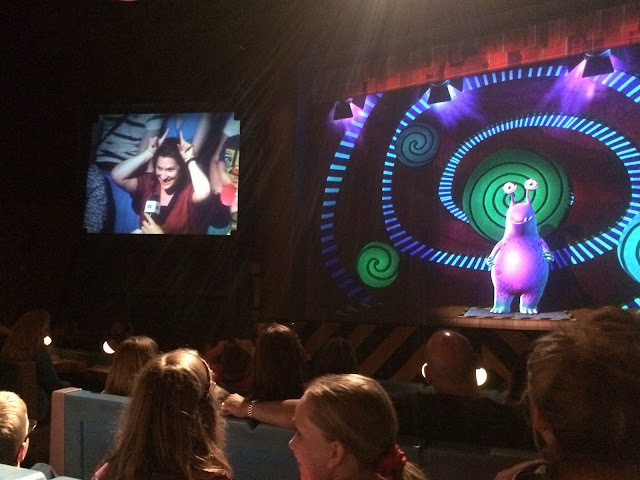 Laugh Floor is one of the most entertaining attractions in Walt Disney World. This was especially true a few days ago, when both my dad and sister were a big part of the show. My dad was "that guy" and he had the audience cracking up. My sister, pictured here, was interviewed by Buddy Boil and up on screen for a while. She was a great sport! The amazing thing was that with over 400 guests in the audience, both my dad and sister were featured. Around 4:00 today, we had just left the China pavilion at Epcot and were heading toward Germany. Right after crossing the bridge, we saw that they were blocking off both sides of it to guests. 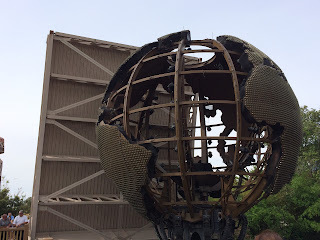 It was time to raise the drawbridge and bring out the "Earth Globe" for tonight's Illuminations. This is a sight that most guests rarely have the opportunity to see, so I had to snap some photos! We spent some time on Tom Sawyer Island yesterday afternoon. While our boy was enjoying Fort Langhorn with friends and family, I was looking for some fun photo opportunities. I took this shot of two audio animatronic blacksmiths working in the horse stable. You can also see a dog drinking out of a bucket of water. It is amazing the number of guests who pass by without noticing the elaborate scene taking place in this section of the fort. Those who do take a peek are usually surprised to see how realistic this area is. 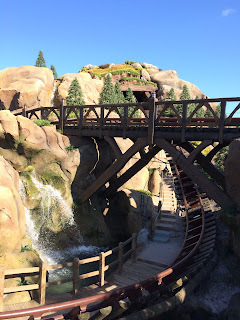 Although the Seven Dwarfs Mine Train is still a few months from opening, there are areas of the attraction that are nearly complete. Yesterday, while walking through Fantasylsnd, I took this shot of the area that faces the Be Our Guest restaurant. This looks like it could be the "big drop" in the coaster. I am certainly looking forward to riding it in the near future! Although the Swan Boats attraction hasn't sailed for about 30 years, the "landing" has remained until a week ago. It was a nice covered area to sit and relax or even have a bite to eat. It was also used for special events and meets. Recently, as part of the hub renovation project, it was pretty much demolished. You can see remnants of it in this shot that I took today. 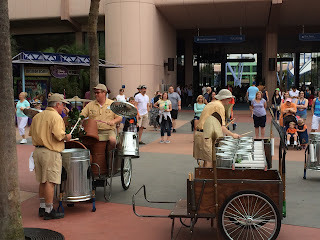 During most of the year, the JAMMitors entertain us with their unique percussion performances at Epcot. However, during the Flower and Garden Festival, this trio turns into the Jammin Gardeners. They turn in their janitorial gear for flower pots and landscaping outfits. 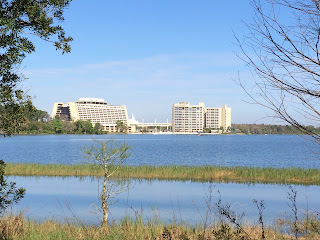 I took this shot today, while giving an Epcot tour. Tonight we watched Illuminations from my new favorite viewing location. 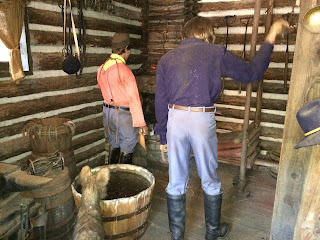 We were up near the entrance to the Northwest Mercantile gift shop in Canada. This spot allows you to see over the crowd on the promenade below, and gives you a great view of the World Showcase Lagoon. I took this shot of the Hotel du Canada during the part of the show when the pavilions first light up. Here is an interesting view of the PeopleMover that you don't see everyday. The attraction went down this afternoon while my tour guests were riding. You can see that they evacuated the ride, and this group of guests were waiting to be led out on foot. 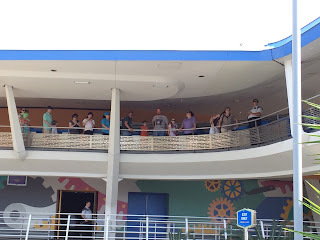 They actually came down a staircase that led them out between Monster's Inc and the Tomorrowland Terrace. This shot was taken above Carousel of Progress, not far from where Buzz Lightyear meets with guests. After a two-park tour today, I found myself making the relatively long walk from Hollywood Studios to Epcot. It was a beautiful day, so I decided on walking instead of taking the boat. 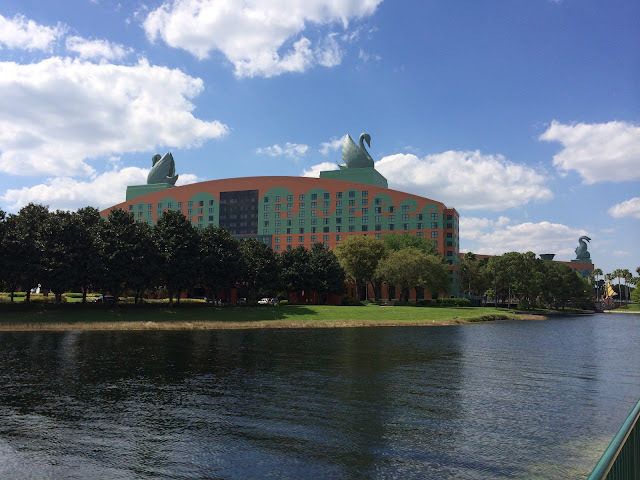 I snapped this shot of the Swan hotel from the path that runs behind the Boardwalk resort. 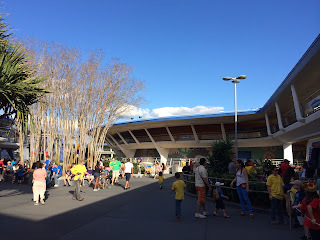 I learned that it is 1.3 miles from Hollywood Studios to the back entrance of Epcot. Today, I was waiting for my guests at Mickey's Philharmagic when I framed up this shot. 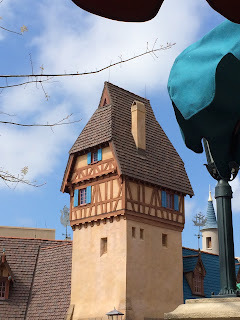 I was on the edge of the Pinnochio Village Haus seating area, and I was looking toward the Fantasy Faire gift shop. This tower sits right on the corner of Peter Pan's Flight, and next to the Philharmagic theater exit. 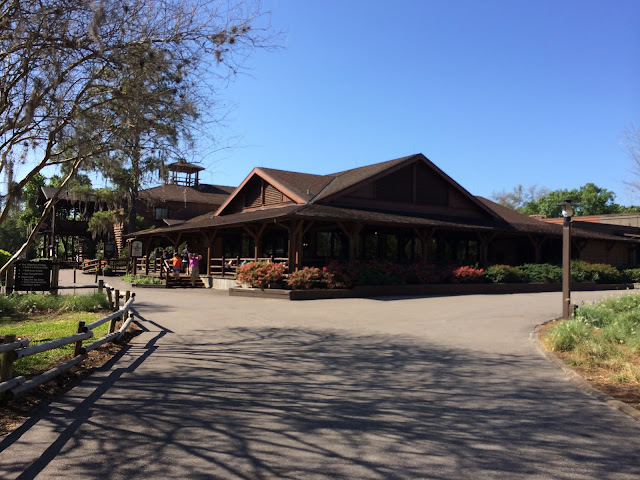 Many guests don't realize that Philharmagic, Peter Pan's Flight, the Columbia Harbour House restaurant, the Hall of Presidents, and even a few gift shops are all part of one large building. I had a chance to see the new Festival of Fantasy parade at the Magic Kingdom again yesterday. There are so many amazing details throughout this parade, that it will take many viewings to see them all. 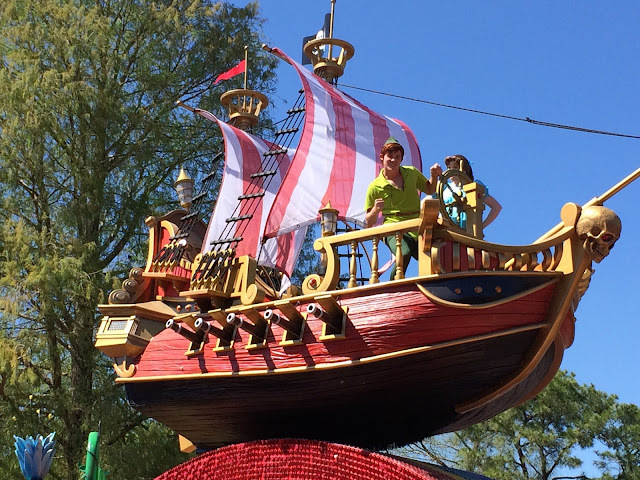 Several of the floats are very tall, including this impressive Peter Pan pirate ship. You can see Peter and Wendy towering over the crowd below. I've heard from a Disney cast member that the garland, which normally hangs across Main Street during the Christmas season, won't be there this year due to the height of these new floats. 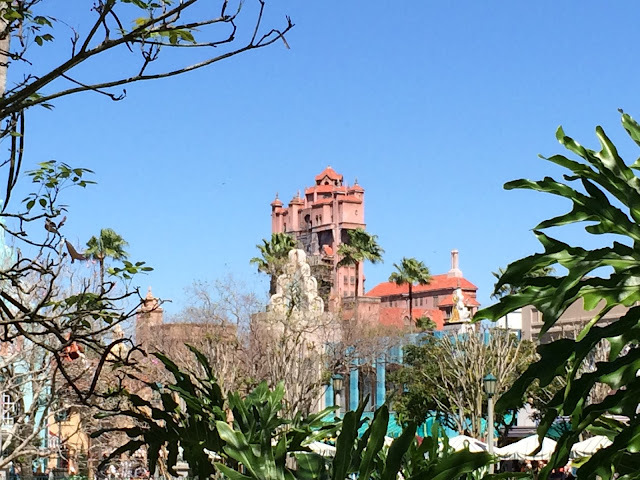 The Tower of Terror is an iconic structure in Hollywood Studios, and it's height makes it visible from many different areas of the park. While giving a tour today, I noticed several interesting views from the area near Echo Lake. I was not far from the entrance to Indiana Jones when I snapped this shot. I like the way the tree branches framed the photo for me. This elevated view of Storybook Circus could only be from one place. Of course this photo was taken while riding Dumbo. I enjoyed this attraction with my wife on our anniversary last week. She was piloting the flying elephant while I was playing photographer. This year, a Mickey topiary is located to the south of Spaceship Earth, facing the center of Future World. He is there with both Minnie and Pluto, but I decided to focus on Mickey for this shot. I was walking through this area while giving a tour, and couldn't resist snapping a photo of the "Big Cheese." You can see that he is holding some flowers and even has a butterfly sitting on his nose. The Fountain of Nations sits at the center of Future World. It comes to life on a regular basis, with its water "dancing" in sync with several different soundtracks. 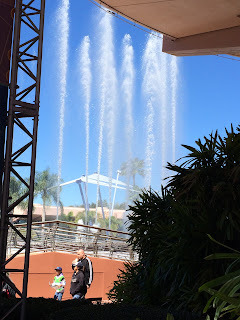 A few days ago, I walked out of the Mouse Gear gift shop near the end of one of these fountain shows. I was able to snap this shot of the water reaching it's 80 foot peak during the finale. 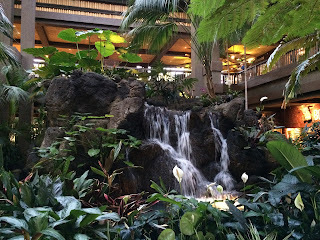 While waiting for my tour guests this morning, I took many pictures of the waterfalls in the center of the Polynesian lobby. There are some rumors going around that they may be removing this amazing "centerpiece" from the lobby to make more room for check-in counters. This resort has been part of Walt Disney World since opening day in 1971, and the waterfalls have always been there. Hopefully these rumors turn out to be false, and we will able to enjoy the Polynesian waterfalls for many more years. 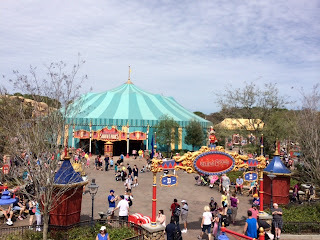 One of the many renovation projects at Walt Disney World was completed a few days ago. The old outdoor seating area at Cosmic Ray's Starlight Cafe in Tomorrowland is now totally enclosed. There are more tables and chairs, and they are all located in air conditioned comfort. However, I'll miss the old configuration, as I enjoyed sitting on the outdoor patio whenever the weather was nice. I took this shot from a spot that used to be outside. I always like shooting unique angles of familiar Walt Disney World structures. I had this opportunity yesterday while on a leisurely stroll with my wife. We were walking on the dirt path that connects Fort Wilderness to Wilderness Lodge. 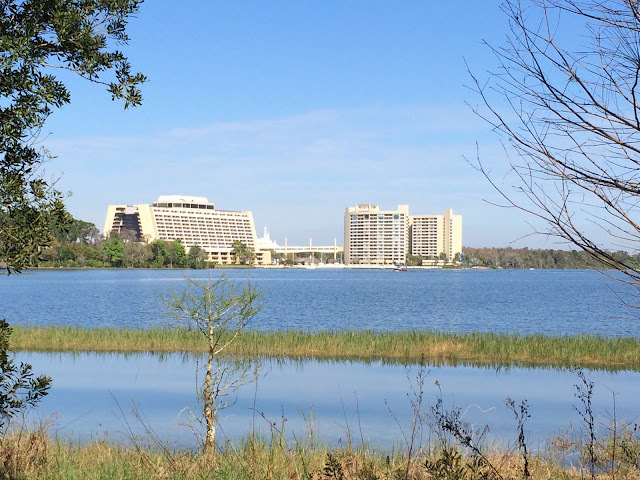 Most of the path has tall grass and shrubbery blocking the view of Bay Lake. However, when we came upon a small clearing, I couldn't resist taking this shot. Today, my wife and I celebrated our 14th wedding anniversary. Of course we went to the Magic Kingdom, but we wanted to try something new for breakfast first. We decided on Trails End, since neither of us had been there before. This restaurant, located at the Fort Wilderness Campground, was a fantastic choice. It featured a buffet that had standard stuff like eggs, bacon, and waffles, but there were also some very unique items. We both loved the French toast bread pudding! 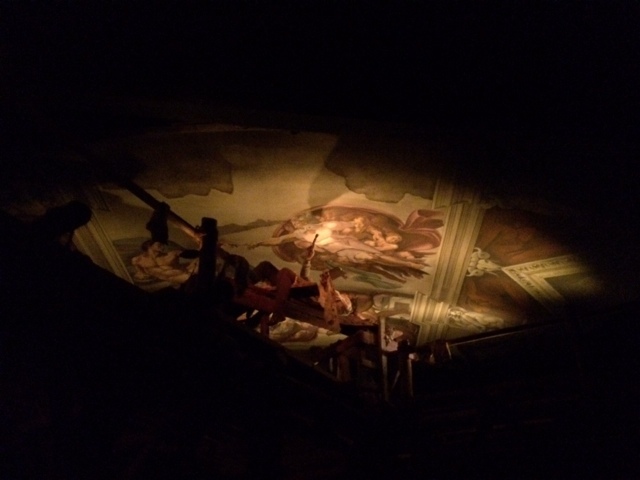 With the newest iPhone, I'm able to capture dimly lighted scenes inside of attractions without using a flash. This is the case with the Sistine Chapel scene in Spaceship Earth, where Michelangelo is painting the ceiling on his back. Although this ride has been updated over the years, it is still one of the true classics at Walt Disney World and a favorite of mine. I took this shot while riding with my son last week. Today was the debut for the new Festival of Fantasy parade at the Magic Kingdom. The parade route was packed, and many guests staked out their spots hours before the 3:00 start time. I was lucky to find a great location in Frontierland at about 2:45. This first performance was great and I was very impressed with the new floats and music. Disney did a nice job of mixing the old classics such as Sleeping Beauty with the brand new favorites like Frozen. 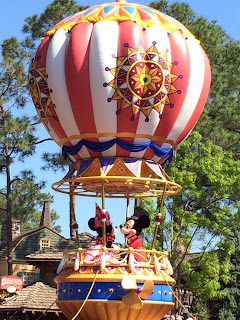 This shot is of the final float of the parade, which is a hot air balloon carrying Mickey and Minnie. 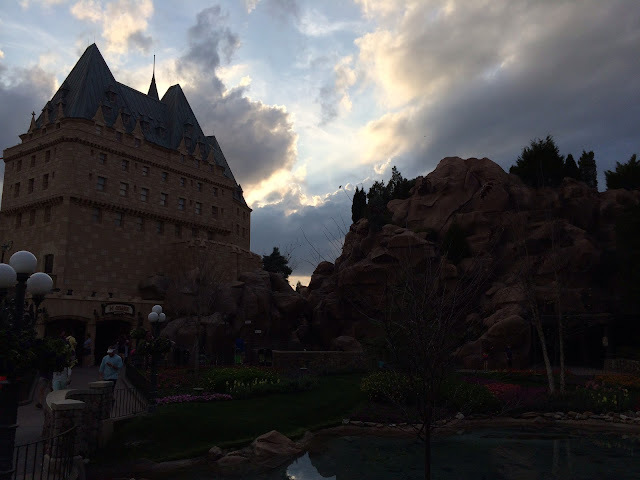 A few nights ago, I found myself in World Showcase walking past Canada. The sun was going down behind the pavilion and I liked the way it created a silhouette for this photo. You can see the outline of the Hotel du Canada on the left and the Canadian Rockies on the right. Yesterday, my son and I took the ferry boat from the Transporatuon and Ticket Center to the Magic Kingdom. Shortly after pulling away from the shore, I looked out the port side of the ship and saw something interesting. 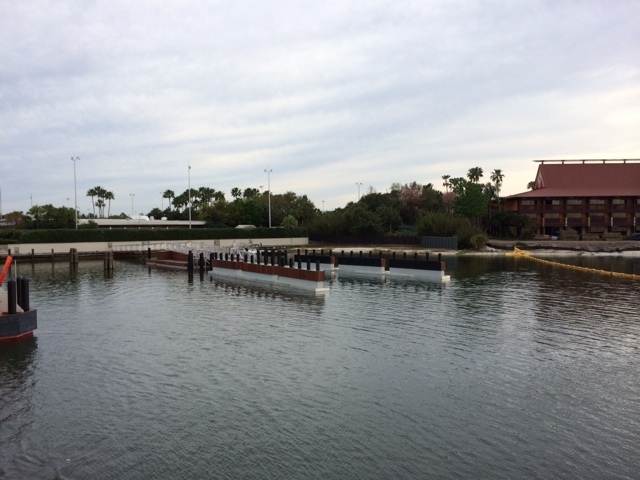 There is a second dock that appears to be nearly complete. This will allow for two ferry boats to be docked simultaneously. Up till now, the incoming ferry would have to wait until the outgoing one had pulled away before docking. This new setup should allow for a much higher volume of guests transported per hour. My son and I completed all five treasure hunts in "A Pirates Adventure" at the Magic Kingdom this afternoon. This fun, interactive game is a great way to explore Adventureland. We learned that when you do all five "adventures," you are rewarded with a special finale scene as well as an exclusive Pirate Mickey sticker. 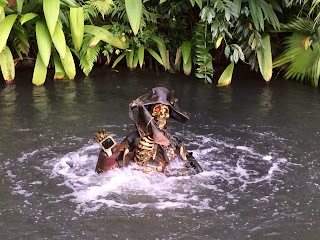 I took this shot in the area of the Jungle Cruise. The skeleton Pirate rises out of the water to reveal a hidden treasure. 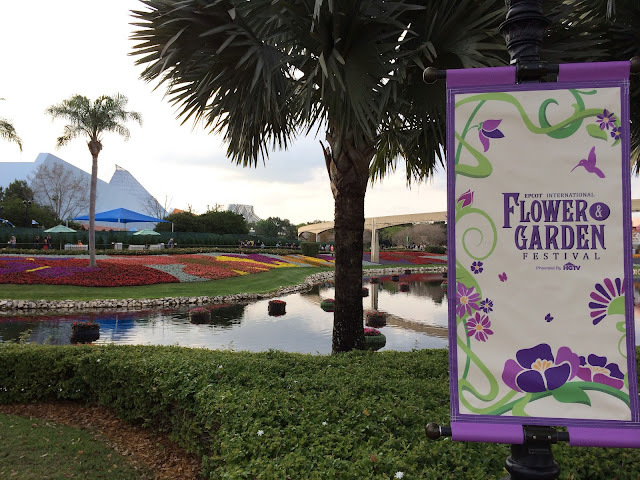 Today was the start of the 21st Epcot International Flower and Garden Festival. 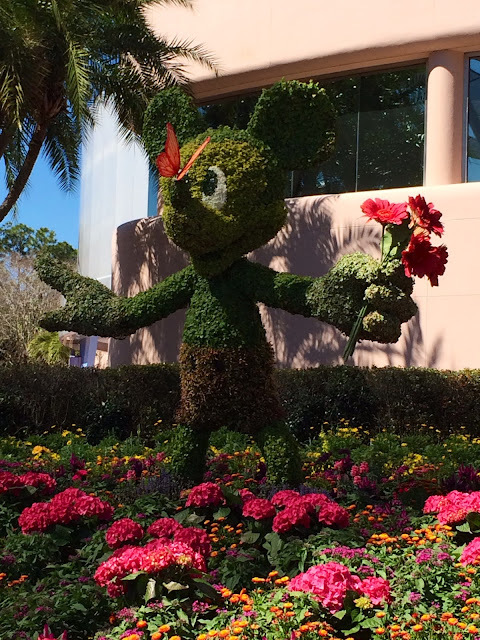 This annual event features amazing displays of flowers, topiaries, and even butterflies. In this picture you can see a huge area that was transformed from a lawn into a giant flower bed. 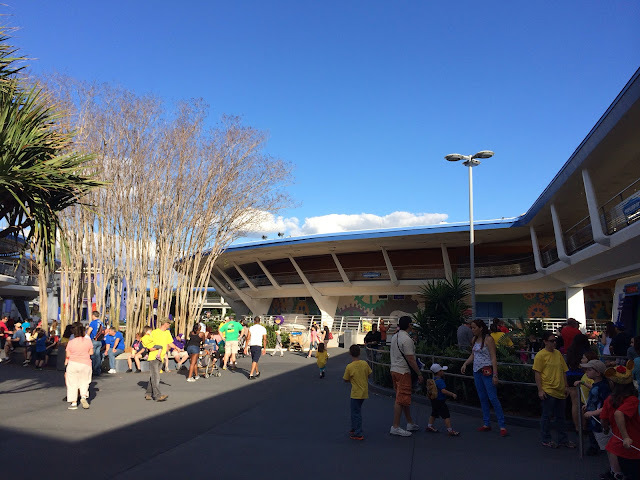 I also got the Imagination pavilion in this shot. The original Journey into Imagination opened on this date, March 5th, in 1983. Tomorrow is the official start to the 2014 Epcot International Flower and Garden Festival. 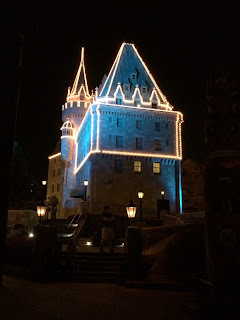 However, most of the displays were viewable tonight, as my son and I strolled around the World Showcase. 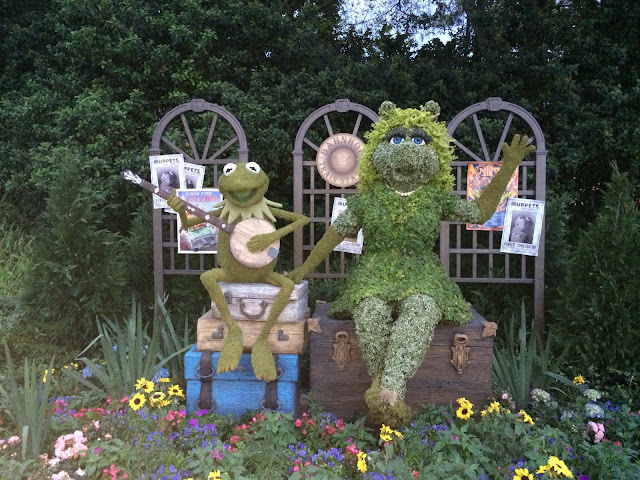 The Kermit and Miss Piggy topiaries caught my eye, as they are making their debut at this year's festival. They are located in an area not far from the Germany pavilion. It makes sense for these characters to appear at the festival, as the new Muppet movie is coming out this month. 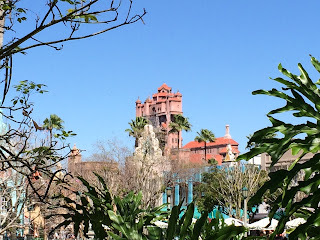 I'm always looking for different perspectives of familiar spots in the parks. Yesterday, I was standing in Tomorrowland when I decided to snap this shot. 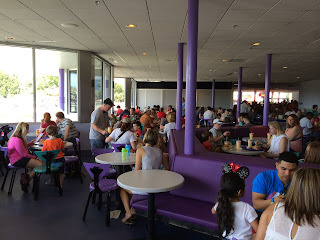 You can see the Carousel of Progress and the PeopleMover. I was standing near the line for the Buzz Lightyear character greeting. However, for us nostalgics, this was the previous site of the Galaxy Palace Theater. 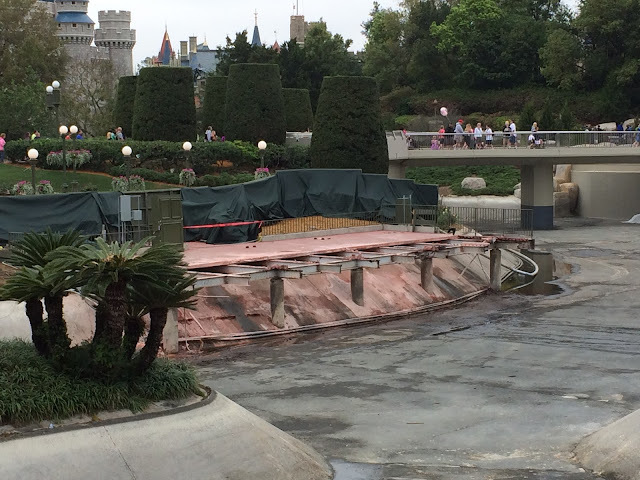 The moats that surround the hub at the Magic Kingdom have recently been drained for a refurbishment. It is interesting to see how they look without water. 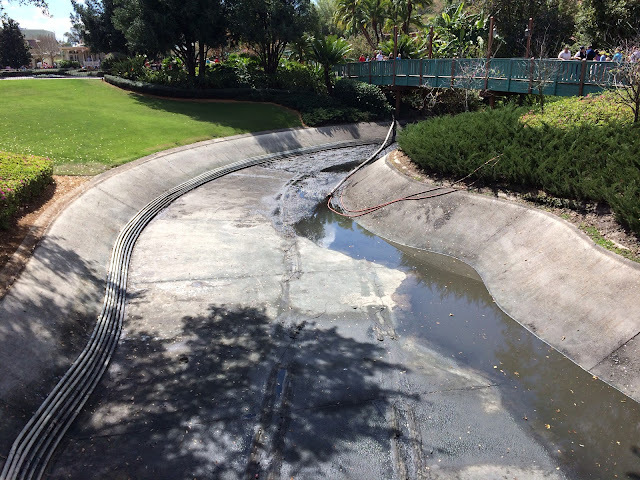 In one area that hadn't been cleaned yet, I saw a nice camera and other articles that guests must have dropped over the side into the water. They could have been lying at the bottom for years! 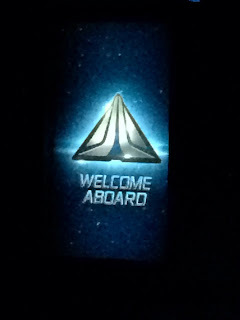 This is the screen that is found on the right side of the cabin on Star Tours at Hollywood Studios. Depending on which first scene you get, this can also be where the "rebel spy" is displayed. I took this shot while riding with my tour guests last week.